Outer Banks Civil War Roundtable. I have become backed up at work and do not have time to keep these minutes up at this time. I will leave the shell so that if we decide to do this again we can. I am keeping up the archved minutes from our first six meetings. The December meeting will be held on Dec. 6th at 6:30 PM and not the third Tuesday of the month like our other meetings. Due to Christmas parties, vacation etc. we decided to have the meeting on the FIRST Tuesday of the month. I hope that does not cause anyone any problems. We have Elizabeth Roberson lined up to speak at the Dec. 6th meeting. This lady recently wrote a book entitled "Don't Weep For Me Dear Mother". The complete collection of letters of Eli P. Landers. Eli Landers served with a Georgia Regiment in the Army of Northern Virginia. (Insert Rebel Yell) The word is it is a fantastic book. I can attest to this being a great book. About half way through the book you feel like you are part of Eli's family. I would highly recommend this book. Mrs. Roberson is with the Fort Branch Battlefield Commission, The Martin County Historical Society, United Daughters of the Confederacy and the Order of the Confederate Rose. Very active in the SCV as well. I heard she did a great job at the Raleigh Round Table. This could be a great one to invite the wives and girlfriends. 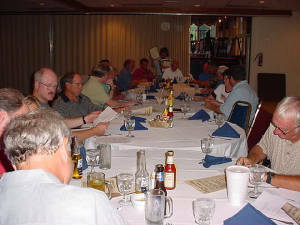 Our Nov. meeting had 26 in attendance. We were in the new clubhouse at Duck Woods Country Club and were very impressed with the layout. Miss Monica waited on us and did a great job. Some of the members brought in period rifles and we had about 15 of our members get up and form a 'battle line". If you have never tryed to aim a period rifle from a "battle line" you would be surprised how odd it feels. The back rank were amazed at how hard it is to fire on the oblique. It is an odd and crowded feeling to stand shoulder to shoulder with another rank behind you with only 13 inches between the front and rear rank. All involved will have a different interpretation when they are reading of firing from a "battle line". Keith Sawyer quickly gave us a demonstration of how the musket was loaded and what equipment the average soldier carried. Then we had four members of the RT that went on the Sharpsburg trip give a talk on some aspect of the battle. Andy Watson did an overview, Mike Ross talked about "Sedgwick's. Rout", Dr. Sledge talked about artillery and Jim Archbell discussed how the Battle of Harper's Ferry tied into the whole campaign. After the meeting we quickly announced we would be taking a trip to Fredericksburg and surrounding battlefields in the spring and Gettysburg in the fall. We are contemplating a weekend trip to Plymouth in Jan or Febuary. Oct. 18th meeting. Twenty-two in attendance. Our fifth meeting on October 18th we featured Grant Ambrose giving a talk about our beloved General James Johnston Pettigrew. Many of you know that General Pettigrew is buried not far from here in Creswell, NC. Grant Ambrose grew up in Washington County on property once belonging to Somerset Plantation and connecting to the Pettigrew Family Cemetery. He attended North Carolina Wesleyan College where he graduated with honors receiving a BA in History and a BA in English. He is a member of the International Society of Social Scientists, Pi Gamma Mu. He is on the Faculty of Lawrence Academy in Bertie County, NC, where he teaches Honors History, AP English, and a wide range of electives including Medieval Studies and The American Civil War. During the summer, he works part time with Somerset Place State Historic Site as a Researcher and Historical Interpreter. His research areas in the Civil War center on General Thomas J. "Stonewall" Jackson and General J. Johnston Pettigrew. He is currently working on a book exploring the life of children in Antebellum Northeastern, North Carolina. We briefly discussed the upcoming trip to Sharpsburg. We also discussed the Nov. 4-6 reenactment of the Battle of Fort Branch. The five members of the Round Table that are reenactors invited the Roundtable to come out to see us. For our fourth meeting held on Sepember 20th meeting we featured Lee Hadden who spoke on the 26th North Carolina at the Battle of Gettysburg. R. Lee Hadden has a BA from UNC, a BS from Excelsior College, and a graduate degree from East Carolina University. He has been a reenactor for almost 30 years, portraying all three sides: Confederate, Union and civilian. He was a long time member of both the 24th Michigan and the 26th NC reenactment units. Currently he is the president of the 4th NC regiment, which is celebrating its 37th year (1968-2005) of quality living history and reenactment. Most recently, he has portrayed a civilian representative of the Confederate Nitre and Mining Bureau who oversaw the manufacture of potassium nitrate from cave dirt. This living history was done at a historic cave site that was actually used as a Confederate manufactory in Lewisburg, West Virginia. Mr. Hadden has written a handbook for Civil War reenactors, which is now in its second edition, and has written a number of articles concerning the Civil War and reenacting as well. He is currently writing a book on captured scientific maps, stolen libraries from occupied countries by the Nazis, which were used by the advancing German armies during WWII. He is also writing a history of the 4th North Carolina regiment and of the 19th Maine. Discuss Outer Banks Visitors Bureau event. Have Alex Leary talk on The Battle of South Mills and the Mapleleaf Prisoner Escape. Our third meeting held on August 16 went very well. We had nineteen in attendance. We all had a great dinner and had a great time with everyone getting to know one another and discussing history. It was a great social hour. Then Mr. Alex Leary assisted by Worth Williams gave his presentation. A wonderful job, thank you so much Alex and Worth! First Alex showed us some relics that had been taken off of the South Mills Battlefield or surrounding area. Then he showed us three of his actual period rifles. An Enfield, a Springfield with bayonet and an 1807 Prussian 72. caliber that weighed eleven pounds. His presentation of the Battle of South Mills was prefaced with the lead up to the battle and the reasons of its importance. Everyone thoroughly enjoyed the talk with the Power Point accompaniment. After that talk Mr. Leary told us about the Mapleleaf prisoner escape and guerilla actions and the pursuant “Sherman like” punishment of northeastern Currituck County by General Wild commanding two thousand USCT’s. Some brutal actions taken on both sides. Clyde Joyner also brought in some relics he had found on the South Mills Battleground. We quickly discussed the upcoming assistance we will be giving to the Outer Banks Visitors Bureau. The Visitors Bureau has asked us to help entertain, educate and welcome three bus loads of tour directors visiting the Outer Banks in September. Keith Sawyer passed out the form for the Sharpsburg trip. Anyone not in attendance that wants to go on that trip just let me know and we can get you the form. Appointment of officers. Discuss Sharpsburg Trip. Decide on Dues for Associate Members. Have a Nice Dinner. Our second meeting on July 19th was quite a success. Our speaker was fantastic. Roy Archbell did a wonderful job on his presentation of the "Mule Shoe" at the battle of Spotsylvania. There were 12 people in attendance and I think all were mesmerized by Roy's talk. None of us wanted it to end. Roy had an enlargement of a map of the battlefield with the troop placements on display. Fantastic job Roy! Here is a link Roy provided with information and pictures of the Battlefield. What a great night we had. Thank you Roy! We had a quick business meeting while waiting for our dinner to be served. By the way, thank you Duck Woods Country Club for the meeting spot, good, cheerful service and fantastic food. I think everyone was very impressed. Miss Monica did a great job. Thank you Monica. We quickly appointed officers. Pat Sawyer was appointed Treasurer, Keith Sawyer was drafted as Vice President and Mike Ross appointed as President. Pat will work on getting us a Tax ID Number. We have a few attorneys in the OBX Round Table so she will contact one of them for assistance. We decided that Associate Members will pay $15. per year and Full Family Memberships will be a whopping $25. per year. We discussed quickly the Sharpsburg Trip and decided we needed a registration cut off at the next meeting or soon after that to establish how many will be going and make travel arrangements. Randal Garrison will be our tour guide. We quickly discussed who could go up early on Friday vs. who would not be able to leave until after work on Friday. That would put them arriving at the hotel very late. We would be leaving for home on Sunday morning and stopping by the Balls Bluff Battlefield on the way back. Mr. Garrison is a full service tour guide and a good friend to the members of the Round Table who are in the 26thNC. The man is a walking encyclopedia but with a great personality. We are very lucky to have his assistance. Andy Watson is going to check on “Vans” for transportation. Thank you Andy for the web site assistance.